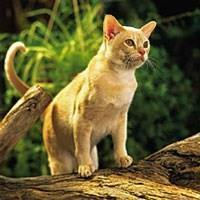 The Burmese, with its exotic appearance and wonderfully affectionate nature, is a cat with personality plus! With it's happy disposition and affectionate nature, the Burmese will retain it's tomboy playfulness and curiosity throughout it's life making it an ideal playmate for children. Its family history dates back almost 400 years, but the Burmese we are familiar with today first originated in the USA in 1920, by crossing a Siamese with a cat imported from Burma. The only natural breed of brown cat, the Burmese has a short, glossy, satin-textured coat traditionally in a warm sable brown colour and gold eyes. Other colour varieties are now available ranging from red and cream to lilac and tortoiseshell. Elegant and exotic looking, they are powerfully built with excellent muscle tone making the Burmese surprisingly heavy for it's size. They have a long body with rounded chest, rounded ear tips and small feet. Often referred to as the 'dogcat' they love to perform tricks and can be easily trained to retrieve toys like a dog. Highly intelligent, affectionate and extremely loyal, these cats are very talkative although generally quieter than the Siamese. They enjoy the company of other cats and even dogs and love nothing more than being in contact with people and being the centre of attention.